We are adding a JSON language implementation to the WinForms SyntaxEditor samples for the next maintenance release. 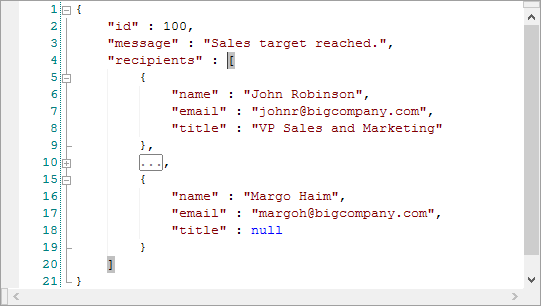 This new syntax language example will be included in the next WinForms Controls maintenance release. In this quarter we published the 2014.1 versions of our WPF, Silverlight, WinRT/XAML, and WinForms controls. These versions included a lot of new controls and feature enhancements for our existing controls. Check out the release posts for more detail. Our free Code Writer Windows Store app had a couple releases that added context menus, new file types like JSON, many find/replace improvements, and much more. SyntaxEditor for WPF - ANTLR v4 Support? 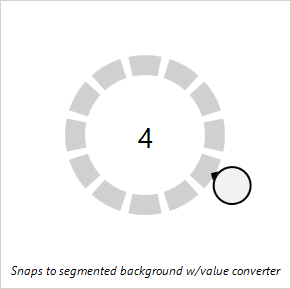 The 2014.1 versions of our WPF, Silverlight, and WinRT/XAML controls were released last week and all contain several handy components in them, such as the RingSlice control we talked about several days ago. In today's post, I'd like to show off the new RadialSlider control. The RadialSlider control allows for quick selection of a degree value, which can easily be converted to some form of scalar value. The control uses an embedded CircularThumb control, but is otherwise transparent. It is meant to be used in conjunction with the RingSlice control and have that control render the slider's value UI. 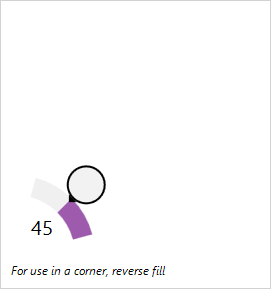 Radial sliders function just like normal linear sliders however instead of moving the slider thumb in a straight line, the thumb can move in a circular fashion around the slider's center point. This sort of UI allows for additional precision when compared to linear sliders, especially with touch interaction. 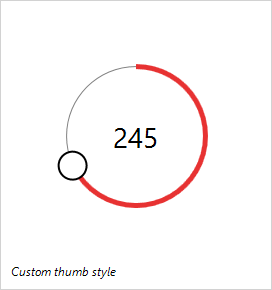 RadialSlider supports minimum/maximum ranges, infinite wrapping mode, customizable thumb styles, and more. 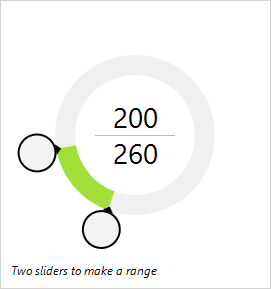 Combine two RadialSlider controls on top of each other to enable range-based selection. The end user simply grabs the thumbs, either via touch or mouse, and drags in a circular fashion to alter the values. The RingSlice controls that render the current values track with the dragged thumb. 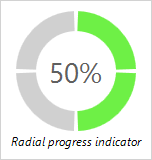 The RadialSlider control is available in our WPF, Silverlight, and WinRT/XAML Shared Libraries and is licensed for use by any of our customers of those control platforms. Download v2014.1 and check it out! 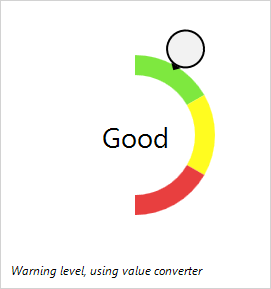 Due to an issue we found with clicks on SyntaxEditor margins that was introduced in the last build, we just published a fix in new v2014.1 maintenance releases for our WPF, Silverlight, and WinRT/XAML controls. Details on the updates can be found in this announcement post. The 2014.1 versions of our WPF, Silverlight, and WinRT/XAML controls were released last week and all contain several handy components in them. One that I'd like to talk in more detail about today is the RingSlice control. The RingSlice control renders a portion (or the entire circle) of a ring shape. Its start/end angles, radius, thickness, and other stroke properties can be set. In the screenshots above, we see a RingSlice rendering a full ring and another showing how end caps can be customized. In the screenshots above, we see how the same RingSlice control can have different stroke settings applied to it to provide dash effects. Other very interesting composite controls can be created by using the RingSlice control together with other controls. The screenshot above shows how four RingSlice controls are used to surround a TextBlock and make a segmented progress indicator. The fill of each RingSlice can be changed as progress occurs, so that the current step is reflected. 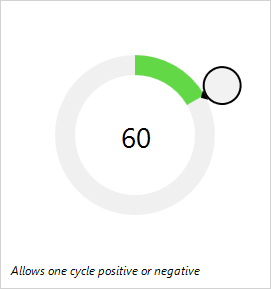 Finally, this screenshot shows the radial graph of a numeric value. 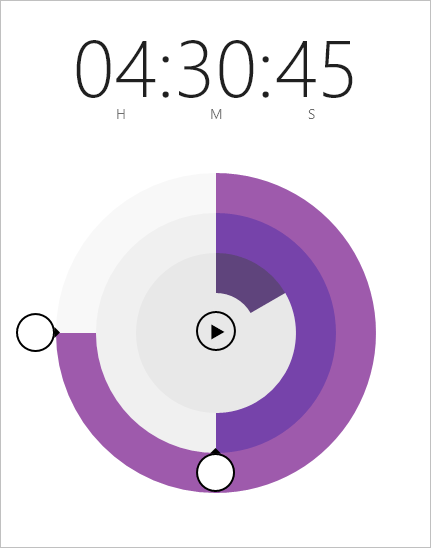 Simply animate the end angle of the RingSlice to create a dynamic presentation of the data. 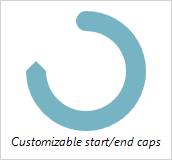 The RingSlice control is available in our WPF, Silverlight, and WinRT/XAML Shared Libraries and is licensed for use by any of our customers of those control platforms. Download v2014.1 and check it out!